The smell of burning charcoal touches my nose while I was holding a skewer of pork satay during the day of rush hour at a street food market in Bangkok. It comes now to make a decision between a warm creamy savoriness or a sour-distinctive freshness that I needed to make it faster than my two brothers, Golf and Gift, waiting to tackle; we called it—The Pork Satay combination battle. I and Amy were sitting down planning what we were cooking for the weekends. 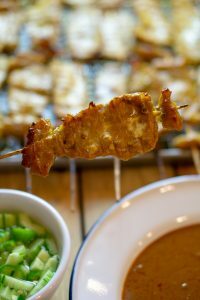 We came up with a few Thai street foods back in our childhood but a memorable family scrimmage that came across was a set of skinny marinated pork in skewers with peanut sauce and cucumber salad. Thinly slices of pork loin with almost 50% of a fat part are marinated in herbal coconut milk overnight, then inserted on bamboo skewers. And then, They’re grilled on a reliable consistent charcoal heat til perfectly tender and give juiciness. I ordered 50 skewers for 5 of us, but the vendor generously gave us 52 skinny sticks which meant we could manage 10 for each with extra 2. Of course, we were young and we didn’t want to be a loser—for sure, my parent would make a sacrifice! We started the pork satay war. I likely to dip it with peanut sauce because it has a spicy nutty-creamy feel to it. The pork satay had a smell of herbal aroma which spicy and cool feeling against it to make my mouth watering. The sweet-salty flavor in one-single bite contains everything I need to feel about all herbs that marinated for a night and the juice from the fat that covered. I totally forgot to count to be a champion of the last two. The plate of peanut sauce was gone unsurprisingly; cucumber salad was left with a mess, leftover skewers were sitting in our plate waiting to count. I didn’t care anymore as the pork satay was soooo good. Satisfying. But I lost actually. I could stuff only 9 skewers and I felt suffering. I miss the unforgettable memory of younghood. Now, I’m far away from home and grown up but the feeling, smelling of the satay still lingering my mount. We will definitely make this, I told Amy. She agreed because the same memory applies to her brother. Chicken Satay or Pork Satay? The result of searching is against our sensation when I need to pick between chicken or pork to find what people prefer. 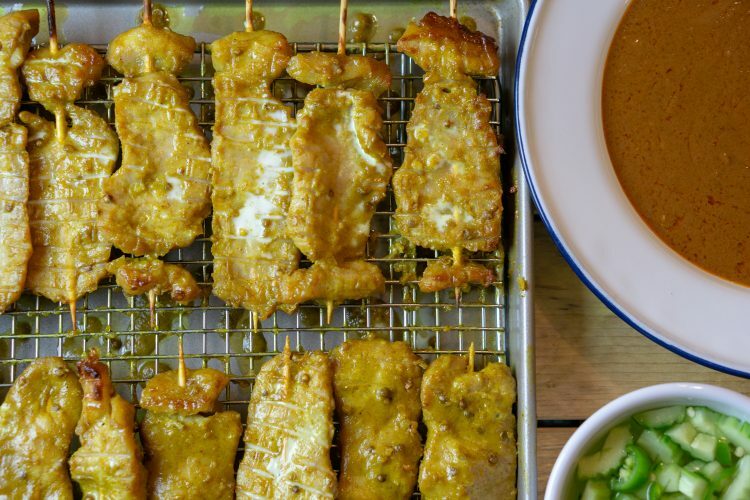 Chicken satay is more popular than pork and most Thai restaurants vend the chicken so well. But, the chicken breast doesn’t hold the fragrant as same as pork, Amy resists. Chicken satay is widely sold in the worldwide outside of Southeast Asia. It is the famous choice of meat if you prefer to make this at home. The sauce marinade is the same as I will show you everything in it. Find them out at your local Asian store or Amazon. Now it’s your options. Maybe turkey, shrimps, tofu, beef or lamb. 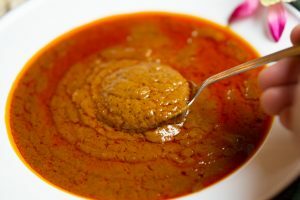 Add curry powder, brown sugar, vegetable oil, white pepper powder, and the rest of the coconut milk, and then blend it on high until it well-mixed. That’s it for the marinade sauce. Use about 2.5 lbs of pork loin with some fat which we’re going to cut separately and stick to the skewer as well. You can skip adding pork fat if you don’t want it or trying to eat lean but I can tell ya, this is the best part of the savory juiciness creation. Start with using one hand holding a very sharp chef knife, and the other hand spread the pressure on top, and slice as close as possible to the fat layer. Save the fat part. Now, slice as thin as the diameter of your skewer; 1 inch wide and 3.5 inches long if possible. Cut the fat part thicker in 1-inch x 0.5 inch thick. This will give you some fat juice while you grill or broil. After finish cutting and slicing meat, marinate it for a night or at least 10 hours. First, soak the bamboo skewers in the water; this will help you stick the pork easier and not burn them. 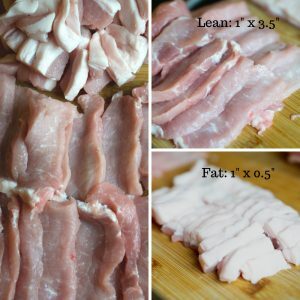 Insert pork fat first, followed by sliced lean pork, and you might close it with a fat again. Meanwhile, preheat the grill or oven to 400 F. Set up the grill by folded foil paper to protect the bare skewer from burning. Spray the grill, lay the pork satay down and try not to overlap. Brush with the marinade occasionally and turn them over when one side is already cooked(8-10 mins each side). Try not to turn too many times. 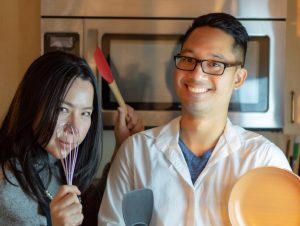 Note: I and Amy live in an apartment where we don’t have a backyard to grill, and the weather is freezing in the winter to use our uncle ‘s outdoor kitchen, so we cook the pork satay in the oven using broil mode at 400F in the middle shelf. Use a strainer with a tray underneath it. Broil for 12 mins each side, brush them 2 times. You’re not going to burn it like grilling for sure, and the texture is even more juicy and tender. But you need to sacrifice the smell of burning charcoal. 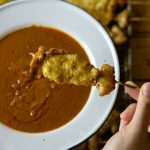 You can’t go wrong with a good peanut sauce to go with Satay. This recipe I’ve posted is real and authentic as I’ve developed the taste as close as the peanut sauce I ate when I was younger. 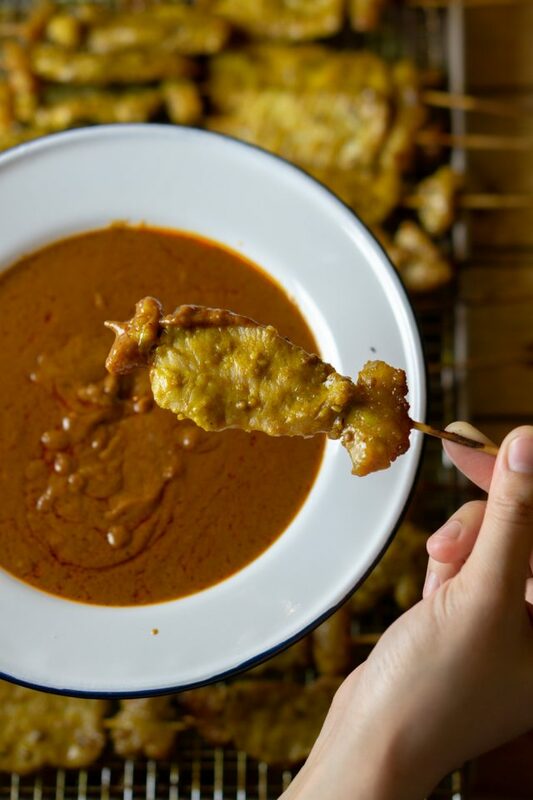 You can call it a day when you dip the Satay with the peanut sauce, but the eyes of our taste buds don’t say that. To win the satay combination battle, you need a cool fresh cucumber salad to cleanse your mouth ready before the next one. So, I try to switch dipping between the creamy peanut sauce and sour-sweet cucumber salad. As we agree on, we can’t mix between these two sauces because it’d be a mess, mom says. 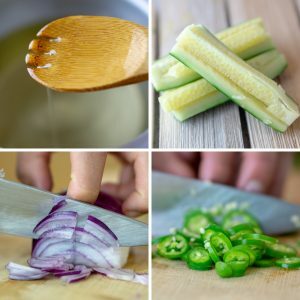 To make, you need at least 2 hours to let it chill before adding cucumber, red onions, and jalapeños. This should be a fun family activity but warn your kids; bamboo skewers have sharp peaks. The rule is simple. You need to eat it as much as you can. Each bite is for one sauce only. The trick is to dip alternatively between sauces. Peanut sauce keeps you motivated, meanwhile, cucumber salad is refreshing your mount for the next one. 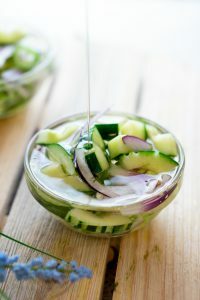 When I was a little child I hated cucumber salad because there were too many vegetables(actually not!). But I started to like vegetables from then, especially cucumber and onion. Kill two birds in one shot! Whenever you have a free time with your kids, this would be a fun thing to do. 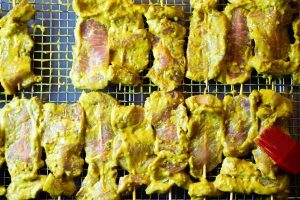 Pork satay is a perfect snack meal for your family. If you have trouble convincing them to eat a vegetable, start it from here as my mom did. Also, Satay is an appetizer for any kinds of party. I make this for Thanksgiving for my family; choice of meats can be varied: chicken, turkey, beef, shrimps, tofu, or lamb. With this marination, you’re not going to be disappointed. Lastly, please comment below what is your favorite choice of meats? And how do you enjoy it? The marination of pork satay. 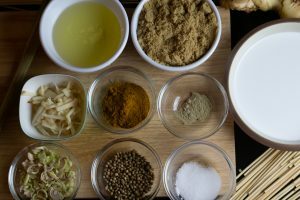 Satay marinade recipe. This recipe card is not included how to make the peanut sauce and cucumber salad. Please see the information in the post. Slice as thin as the diameter of your skewer; 1 inch wide and 3.5 inches long if possible. Cut the fat part thicker in a dimension of 1" x 0.5" thickness. Keep it for a night or at least 6 hours in the refrigerator. Soak the bamboo skewers in the water. Insert pork fat first, followed by sliced lean pork. Spray the grill, lay the pork satay down and try not to overlap. Brush with the marinade occasionally and turn the skewers over when one side is already cooked(8-10 mins each side). Enjoy with peanut sauce and cucumber salad.